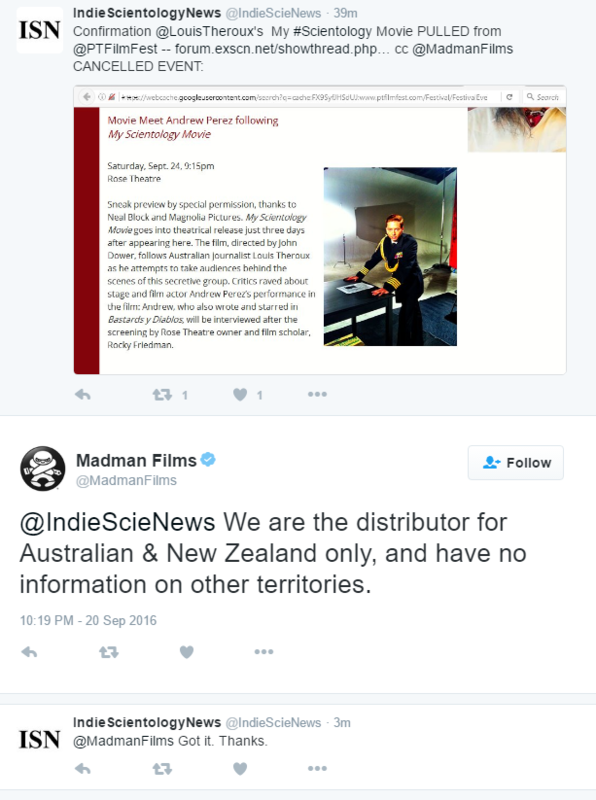 Madman Films has further responded. 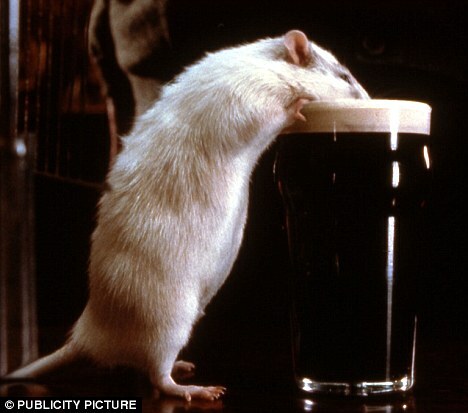 I smell a rat. Perhaps it goes by the name of Kendrick or Bert. They shot down the bill boards in LA twice. They failed with the other two bill boards. 2 to 2. Now they are 1 to 0 against Louis. I guess that's a power graph? The other was flat lined emergency. Go OSA!! Yeah Baby! Suppress those suppressives. Up stats! Break out a couple beers! The Distributor who cancelled it from Port Townsend is MAGNOLIA PICTURES. Last night alarm bells went off around the various forums about Louis Theroux’s My Scientology Movie being pulled from the Port Townsend Film Festival. The festival organizers themselves said the film was pulled by Magnolia Pictures, the movie’s American distributor. Naturally, that caused some worry — was the film under a legal onslaught from Scientology?Well, we heard back from the Theroux camp that the film being pulled was an unfortunate result of a contract glitch between the BBC (which produced the film) and Magnolia, and that it had nothing to do with outside forces (i.e. Scientology lawyers, etc.). So we will hope this was just an unfortunate event that won’t affect the film’s opening in the UK next month and the US in January. If we hear differently, we’ll let you know. 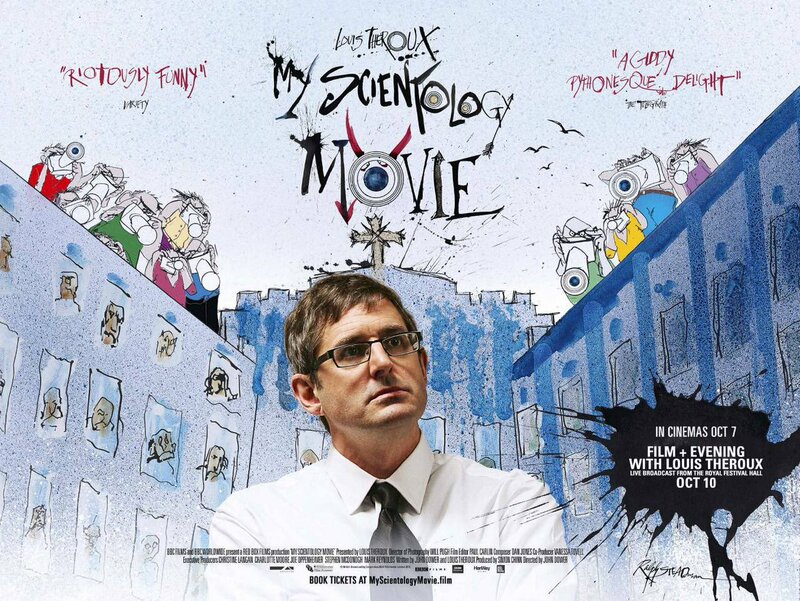 Louis Theroux's My Scientology Movie gets a Ralph Steadman poster. Louis Theroux's first theatrical release has been a long time coming, so it deserves something a little special to usher it to the big screen. This new poster by Ralph Steadman, iconic cover designer for Hunter S. Thompson, should do the trick. The film getting the gonzo treatment, of course, is My Scientology Movie. Take a look below. It's looking increasingly like his highly anticipated feature film, My Scientology Movie won't be getting a release in Ireland due to blasphemy laws. The film has a UK distributor, Altitude and is set to be released over there on October 14th. However as we reported earlier this year, an Irish distributor has yet to be confirmed and it's looking likely that none will be. The main stumbling block seems to be Ireland's blasphemy laws and in particular the The Defamation Act of 2009. According to that piece of legislation, any "publication or utterance of blasphemous matter" against any religion is an offence and carries a fine of €25,000. The Act does allow for a defence of work that has "genuine literary, artistic, political, scientific, or academic value", which this documentary most likely will have. However it looks like there aren't any distributors willing to take a chance on the film for fear that they could be found to be in breach of the legislation. Graham Spurling, the owner of Movies@Dundrum, Movies@Swords, Movies@Gorey and SGC Dungarvan has confirmed on Twitter that the film will not get an Irish release and has suggested that the blasphemy law may be to blame though he cannot speak for the distributors. Louis Theroux reacts to My Scientology Movie not showing in Ireland due to blasphemy laws. My Scientology Movie: Louis Theroux documentary unlikely to get Ireland release due to blasphemy laws. 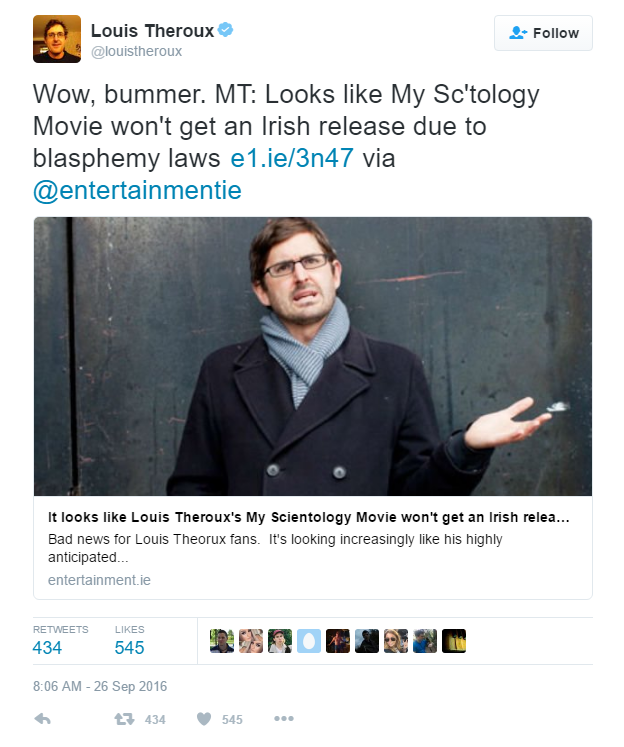 Louis Theroux fans hoping to watch My Scientology Movie in Ireland look set for disappointment as the country’s blasphemy laws threaten to keep it from cinemas. There are currently no plans to show the film in Ireland. The possibility of a no-show for the film in Irish cinemas first emerged over the weekend when Entertainment.ie reported that it appeared the film wouldn’t get an Irish release due to blasphemy laws. However, a legal expert has said that in his opinion there is no way an Irish screening of the documentary about Scientology could lead to a prosecution on the basis of blasphemy. Dr Neville Cox of Trinity College, a specialist in the Defamation Act, has said categorically that “there is no blasphemy case here”. Cox said that the Director of Public Prosecutions (DPP) would never bring such a case and that no judge in the land would go near it. It wouldn’t even get to a jury. He cited section 36 of the Defamation Act which allows for work to be published or uttered which has “genuine literary, artistic, political, scientific, academic value”, and suggested that the documentary would fall under these parameters. He also doubted that the documentary would qualify as “grossly abusive or insulting in relation to matters held sacred by any religion” in this case. A more real risk, he said, would be a group defamation suit. However, Cox also cast doubt on that outcome, and said that it would have to proven that the documentary defamed one person or an identifiable group of people. How does one defame something infamous? By claiming the infamous as despicable as scientology$ past and present leaders? Is COS able to do to Theaters what they tried to do to the Internet? They are shutting this Film down. WTF can we do about this? Why Ireland won’t ‘ban’ Louis Theroux’s Scientology film. Dr Neville Cox, associate professor of Law at Trinity College Dublin, told The Irish Times: “There are three reasons why the blasphemy laws are of no relevance here.” It is significant, he agrees, that the state does not define the Church of Scientology as a religion with charitable status. My Scientology Movie opens in the UK on October 7th. It will be broadcast on the BBC at a later date. The inflated controversy will do the film no harm at all. But this is the super-paranoid Church of Scientology, and soon they are on Theroux’s tail, trailing his car, implicitly threatening Rathburn, openly filming them, and harassing them with legal threats (they aggressively blanket-deny everything). This prompts the movie’s other masterstroke: Theroux undermining Marty Rathburn’s authority by reminding him that these abusive strategies were originally invented by… Marty Rathburn. Marty doesn’t like that one bit, and can’t hide it. I think Rathburn is – on balance – an anti-Scientology hero, but we deserve the more ambiguous, troubling portrait sketched here. For these reasons, My Scientology Movie belongs in the company of the most serious work done on the church. The more sunlight that falls on this dark organisation, the better for all of us. Louis Theroux crowned BBC Grierson Trustees' Award winner at the 2016 British Documentary Awards. London, 30th September 2016: Documentary maker and presenter Louis Theroux will be honoured with the prestigious BBC Grierson Trustees' Award at the 2016 British Documentary Awards. Earlier this year, the BBC broadcast his A Different Brain and Drinking to Oblivion which has also earned him a nomination in this year's Best Documentary Presenter category. His latest project Louis Theroux: Savile will broadcast on BBC Two this weekend and My Scientology Movie opens at cinemas across the UK next week. PODCAST - Louis Theroux: Journalists viewed as enemies by Scientology. Filmmaker Louis Theroux joins Larry Williams on the Mike Hosking Breakfast to discuss his new film - an expose on the secretive Church of Scientology. 'My Scientology Movie' covers Theroux's attempts to shed some light on David Miscavige's group, and allegations of abuse and brainwashing among Scientology. However, he explains Scientologist aren't particularly welcoming to outsiders, especially journalists. Theroux said during the making the movie he came to realise that "they are genuinely capable of being very nasty, and I've had little glimpses of it, and it's not nice." "When you feel that you're exposed and they might have something that will make you very uncomfortable in some way, and they use it against you, it can be very frightening." ...with Rathbun’s help, Theroux hires actors to show how Scientology’s top-brass operate behind closed doors. If accurate, it’s beyond bizarre. Of course, they say it’s not accurate. They claim to be an honourable organisation, outrageously maligned. A Miscavige of justice, if you will. Maybe that’s so. I certainly didn’t warm to Rathbun, whose sense of self-importance doesn’t seem to have diminished much since he was Miscavige’s right-hand man. But if the Scientologists are more sinned against than sinning, there’s precious little evidence here.